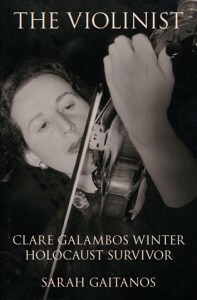 The Violinist: Clare Galambos Winter, Holocaust Survivor, by Sarah Gaitanos (Victoria University Press, 2011) 280 pp., $40.00. ‘Klari’ is longtime Wellington resident Clare Galambos Winter, who, having lost most of her family in the Holocaust, survived to reach New Zealand in 1949 and make a new life in which music figured centrally. Sarah Gaitanos has read and journeyed widely in order to understand and present a complex historical context for what is also a very personal story. Nolar Millar, her first biography, about legendary Wellington theatre director the late Nola Millar, published in 2006, was similarly thorough, running to 408 packed pages. The Violinist, which like Nola Millar, contains an index, copious notes and a full bibliography, is more rather than less interesting for the many different research tracks she goes down. In addition to book and journal sources, a list of websites — such as www.jewishvirtuallibrary — gives readers an entrée into the extensive Holocaust literature, encompassing official records, photographs and oral history recorded over sixty-five postwar years. The main difference with The Violinist is that Gaitanos was able to develop a relationship with her living subject, Clare. This allowed the recording of invaluable oral interviews and full access to Clare’s own memoirs, letters, as well as a large collection of photographs — not only of her Hungarian relatives, but also of her ‘new family’ of New Zealand friends. Born in 1923, Clare Galambos Winter was descended from Jewish immigrants who became ‘passionately’ committed to Hungary, after emancipation in 1867, helping form the core of the country’s professional elite. Andor Galambos, her father, had also served in Hungary’s army on the side of Germany in World War I; like the many German Jews who fought for the Kaiser, he felt betrayed by his country when the Hungarian government brought in anti-Jewish laws. Music was at the heart of this pre-war life. Klari’s grandmother introduced her to the classics, playing piano music of Beethoven, Mozart, Brahms; her great-aunt was a student of Liszt in Vienna. Klari, who sang regularly in the synagogue choir, learnt to play the piano first, and then — what became a lifelong commitment — the violin. As a teenager, she found ‘a beautiful meshing together of people’ in a local orchestra. Shocking stories started to reach the fourteen-year-old Klari — of Germany’s invasion of Austria, and of ‘people they knew being arrested and not heard of again.’ (Since 1922, the Galambos family had lived in Szombathely, close to the Austrian border.) Hitler — popularly called the ‘mad dog’ — was not, however, considered a threat to ‘civilized’ Hungary. Besides, wrote Clare in her three-part memoir, ‘there seemed to be more important things to think about, such as school, music, violin, boys …’. Gaitanos makes a very good job of knitting together the parallel rise of fascist powers in Germany and Hungary, with legislation denying Jews’ rights to travel, trade or work other than forced labour, and finally to any kind of citizenship at all. She also describes how personal reports of atrocities in Poland were at first thought not to be credible, since they were so extreme. Elie Wiesel himself did not, she discovered, believe the deportations and slaughter described by one witness who had escaped execution in 1942. In that year Klari was studying violin, music history, theory and orchestral practice in Budapest at the Fodor, a private music academy. Athough the rumours in her girls’ hostel were ‘terrifying’, few knew of the Nazis’ Wannsee meeting of January 1942, in which agreement was reached on the ‘Final Solution to the Jewish Question’. In 1943, even when informed of the many death camps in full operation, Hungary’s Jewish leaders shut their ears and ignored the implications. The subsequent German occupation of Hungary in March 1944 stunned them, along with the whole country. Gaitanos could not have invented a more shocking and dramatic turning-point to her story. Klari hurriedly prepares to return home to her family, but at the station — wearing a ‘very smart’ blue coat with yellow fox-fur and carrying violin, handbag and hatbox — she is shoved into a concrete room to stand for three nights, crammed in tightly with thirty other women whose only crime is that they’re Jews. In a matter of weeks the recently built ghetto in her town is being emptied out by the first transports of Hungarian Jews to Auschwitz, in ‘the largest and fastest deportation operation of the Holocaust’. Maps, diagrams and photos of the complex and of the inmates at Auschwitz-Birkenau help make real an experience that Clare can only dimly recall: ‘I stepped out of myself and anything that happened there … was so far from what I was. I never even thought of my violin. I never thought of anything.’ The chance of surviving was, however, greater ‘if you had someone’, and for Klari that was her aunt Rozsi, who ‘slept, sat, stood to be counted, queued for food, cared for’ her through five weeks at Birkenau and seven months at Allendorf, where the pair worked at a munitions factory over a winter that was ‘exceptionally harsh’. After liberation in 1945, aunt and niece returned home, expecting to be re-united with family members — a hope that proved hollow. Only one cousin remained to welcome them; Clare wrote in her memoir: ‘It was beyond ordinary grief. It was utter nihil.’ There was another cousin, though, who had gone to New Zealand before the war, who offered to help them emigrate here. After two years of intense difficulty in an environment ‘morally, socially, politically and economically bankrupt’, Klari and Rozsi left Europe on a steamship from Marseilles. At this point (Chapter 7), a second biography begins: the life of 25-year-old violinist Clare, living with her Aunt Rosie in a two-storey art-deco house in Lower Hutt, and artistically ‘adopted’ by a Wellington family, the McKenzies. Because the cousin’s family who helped their immigration did not want to publish their own Jewishness, Clare was at first cut off from Wellington’s Hungarian community, who were mostly Jews. Clare found another community among Wellington’s musicians, when she auditioned for an orchestra within weeks of arrival. There were Jews in this community too, among refugee musicians of the pre-war diaspora, and later among the many distinguished musical visitors to the city. The book’s final four chapters, or ‘movements’ – Appassionato, Resoluto, Doloroso, Grazioso – follow Clare’s 32-year career with the National Orchestra under different conductors and names, rehearsing, travelling and performing all over the country — and overseas; her ‘joyous and bohemian’ life with Swedish cellist and bandsman Karl Kallhagen, whom she later married; her learning to become a New Zealander, taking citizenship in 1955 and buying a house in Mt Victoria; Rosie’s death in 1965 and Karl’s in 1977; her close friendship with Carol McKenzie and Carol’s illness and death; love and marriage with her doctor, Otto Winter, with whom she returned to the synagogue, and his death in 1990. Many lives, indeed: not just one, even in two halves. Music was always important to Clare as representing, beyond language and circumstance, a shared humanity. It was her solace in Allendorf when the officers gave her a violin to play so that they could dance; later, in Wellington, when events like the 1956 Hungarian uprising and the 1961 trial of Adolf Eichmann ‘stirred the pot’ uncomfortably, she took to the music with a passion that blew away everything but the playing. It may be said that the Holocaust ‘defined her’; then again it was music which both recalled her suffering, says Gaitanos, and transcended it. Clare herself describes the ‘shattering’ music of Shostakovich as ‘like flying into some absolutely rarefied air’. This, however, is a biography which is essentially down-to-earth and faithful in the telling of a life-story. However, just as the Nola Millar biography gave a detailed sense of Wellington’s interconnected theatre life in the 1950s and 1960s, and of the development of Toi Whakaari, the New Zealand Drama School, so The Violinist: Clare Galambos Winter, Holocaust Survivor offers, together with its many other strands, a richly interesting take on the development of classical music performance locally, along with an account of the rise of what has become a world-class musical institution: the National Orchestra — now known as the New Zealand Symphony Orchestra. 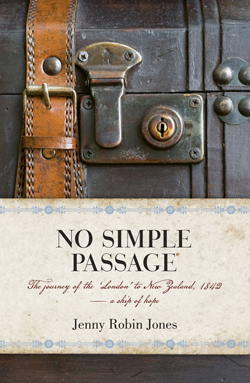 No Simple Passage: The Journey of the London to New Zealand, 1842 — a Ship of Hope, by Jenny Robin Jones (Random House, 2011) 350 pp., $45.00. This book is very different from either historical ‘faction’ such as Ray Grover’s excellent Cork of War (on Te Rauparaha and Te Rangihaeata), or Judy Corballis’s Tapu (on Hongi Hika), let alone orthodox history books. The novelty is appealing because it provides a fresh approach on the early settlement of Wellington. Instead of unfolding a chronologically structured narrative of voyage and settlement, Jones sits, Goddess-like, on the shoulder of her ancestors, expanding on the somewhat cryptic and skeletal story told in the diary and letters of her great-great-grandmother Rebecca Remington and others who travelled on the London as it voyaged to Wellington for 124 days between 29 December 1841 and 1 May 1842. The others include Dr William Mackie Turnbull, obsessed with the illnesses of the passengers, especially the many sick children on board, and William Empson, fixated on the weather and the ship’s progress, or lack of it. Jones starts each day’s entry with Dr Turnbull’s notes on ailing and dying children. Then she fasts forwards to develop some comment or theme revealed in the diaries. In this way the story of her family’s experience is told along with that of other passengers and the broader, Wellington community. There are advantages in adopting this imaginative approach in that it really brings home the awful problem of high infant mortality aboard ship before the discovery of antibiotics. The heartbreak that will affect any parent or grandparent is deepened by the savage irony that these hopeful immigrants thought they were travelling to a healthier place. Trawling around in contemporary records like newspapers also highlights the sheer physical courage required for such a long and uncomfortable voyage. After reading this account the modern traveller will feel ashamed at complaining about the discomfort of long (twenty-four-hour) flights on cramped jets. It is all too easy to forget just how claustrophobic most below-decks accommodation was and the dreadful smells that had to be endured. The sheer terror of storms at sea also helps explain why many migrants to New Zealand, the world’s ‘farthest promised land’ as Rollo Arnold once put it, including some of my own family, refused to ever again travel on any kind of a boat. Some stayed in New Zealand simply because they could not get back to Britain, especially before the advent of steam ships services in the 1870s. Jones’s thorough research in manuscripts, letters and newspapers held in the Alexander Turnbull Library, National Archives and Masterton Archives catches much of the texture of life in early Wellington. Once again she reminds us that settlers, despite their high expectations, experienced much more physical discomfort in poorly built housing served by chronically underdeveloped infrastructure. Rudimentary sanitation made the new settlement anything but healthy and parents had to continue coping with the pain of losing more children. As Jones points out, losing children then was no less painful than in other, more secure periods, despite the reality of high infant and maternal mortality persisting into the twentieth century. Certainly infant mortality remained high in Britain as in the rest of the Empire and the USA, but migrants were disappointed that rates took so long to drop in a supposedly ‘better’ environment. On top of the trauma of losing children came the terror of the 1855 earthquake — an 8.2 monster that would have proved catastrophic in a more intensively settled town. Danger also took on less spectacular forms for adults: clearing forests to make way for farms involved the danger of being burned alive or of having heavy trees falling upon the less expert woodsmen. Cuts, easily gained in bush clearance, could trigger fatal blood poisoning. Travel, too, involved dangers, especially drowning in swollen rivers that could only be crossed on foot. Horses, although nowhere near as dangerous as motor cars, sometimes threw their riders and rolled on top of them. The marginalisation of Maori, from the seven mysterious figures on board the London to those encountered at Wellington, is also probably a fairly accurate reflection of both the attitudes and experiences of the majority of British settlers concerning race relations. Involvement in churches and a host of other social and cultural organisations also rings true, and provides further evidence that contradicts Miles Fairburn’s argument that nineteenth-century New Zealand was made up of atomised, disconnected individuals rather than cohesive communities. As Jones demonstrates, many of the families who came on the London ended up intermarrying and supporting one another in the tough business of building towns and making farms. Jones and Random House must also be praised for the high standard of presentation including the attractive colour reproductions of period paintings. Even if the relevance of one or two seems questionable, they look stunning. Yet, for all its energy and imaginative evocation, assisted by Jones’s lively prose, there are problems with her novel approach. By hopping around so much and playing fast and loose with time, she produces a work that is very retrospective and over-loaded with hindsight. The people whose lives she hopes to illuminate simply did not experience things this way. Rather they engaged with life and its vicissitudes day by day as history unfolded. They did not know that earthquakes were coming until at least 1844, and could only assume that Maori resistance would eventually be overcome. They anticipated that sheep farming and wool growing would earn the colony a living — but there were no guarantees of success. Leaping around between theme and time also makes the interwoven stories a little hard to follow because the narrative drive is frequently disrupted. For this orthodox historian, at least, the experiment would have worked better if the author had related the voyage first and then unfolded the story of what happened after arrival next. Alternatively, holding an imaginary conversation, or creating a dialogue with her ancestors on the London, would have provided more coherence for this reader, at least, than the approach employed here. Of course, others who find mainstream historical writing to be rather dull and plodding may prefer this rather different and highly playful approach. It must be conceded, nevertheless, that nineteenth-century New Zealand was an experiment in every sense, whether we are talking about economic development, environmental transformation, social engineering, cultural formation, race relations, or political systems. Wakefield’s theories and schemes added to the sense of trying something different, but the British migrants who became New Zealanders had to start anew and develop their country in their own way, with or without Wakefield. Adjusting to very different realities involved working through a very organic process, just as eastern Polynesians had become Maori before British settlers arrived by learning to come to terms with the larger land mass and harsher and cooler environment of Aotearoa/Te Wai Pounamu. It is fitting, therefore, that Jones has experimented with the presentation of family and migration history and tried something different. For her imagination, bravery and hard work she deserves plaudits, but like most experiments her approach needs fine-tuning and modification, just as Wakefield’s ideas had to be significantly adjusted in practice to match the difficult realities of a new and very different land. TOM BROOKING is Professor of History at the University of Otago. His books include Seeds of Empire: The Environmental Transformation of New Zealand, (with Eric Pawson), published by I.B.Tauris (London) in 2010, and Lands for the People? The Highland Clearances and the Colonisation of New Zealand: A Biography of John McKenzie (1996). He is currently writing a biography of Richard John Seddon, New Zealand’s longest-serving Prime Minister. 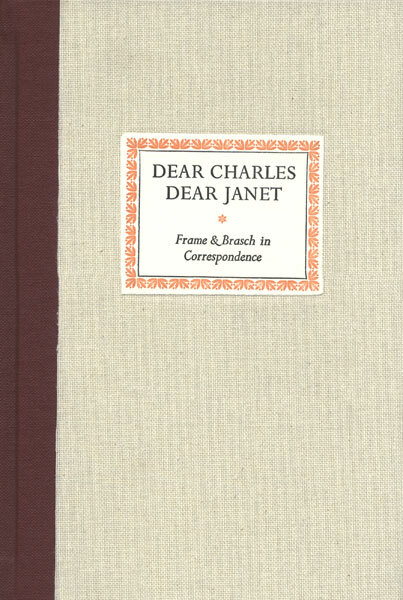 Dear Charles Dear Janet: Frame and Brasch in Correspondence, selected and edited by Pamela Gordon and Denis Harold (The Holloway Press, 2010), 61 pp., $250 (edition of 150). Frame would have grinned and Brasch more likely grimaced, but both would have noted the gentle ironies surrounding this small book of short but often intensely interesting writings. Their letters, including email-sized notes on book loans and afternoon teas, have been preserved in beautiful font on thick cream paper, at a price no pauper writer could afford. The letters, from 1949 to 1978, are torch-beams only. Readers need to go elsewhere for full biographical details. The book begins with Frame’s note sent to ‘Mr Editor’ from Oamaru (1949, between hospital stays). ‘A story. Crumbly and of poor grade. You probably won’t want it. In that case please burn it quickly – quickly – or crush into tinier pieces for Rat Darkness to sneak in and snaffle.’ Charles did not crush the story for Rat Darkness, nor did he reply to her, but he did tell Denis Glover to save it with her other submissions. In 1954 he asks to print one of her poems, and for more of her work, and their correspondence begins. Frame is outwardly diffident at first: ‘I fight off writing, but it has an overtaking habit, like sleep’. Other writers and places are also briefly, evocatively, lit up. Frame finds England peaceful compared to the United States during the Vietnam era, and then remembers Dunedin in July: ‘… soon, the hills will be shadowed gold with the budding broom and gorse; it rains now, I suppose, and you light fires.’ Brash’s reply describes 1969 Dunedin with a Piggy Muldoon in the Capping Parade, and Hone Tuwhare, Warren Dibble and Ralph Hotere composing ‘a sort of humming top which now seems the centre of the town’s life’. The letters mention many other writers and artists, such as Ruth Dallas, the Baxters (Jacquie getting the children to work to pay off debts, while ‘Jim was up the Wanganui’), Frank Sargeson, Ted Middleton, Bill Manhire as an Icelandic scholar (‘rather sullen and silent’ but whom Frame liked), and even Grace Paley. The book has faults. Its price and print-run make it inaccessible to most. The printing is not clear on every page, at least on my copy. A little more contextual information would help many readers, for example, being told early on that ‘Ruth’ was Brasch’s secretary for Landfall. I would also have liked to have read all the letters in their entirety. With you who are blood and water, wind and stone. NICKY CHAPMAN is a writer, editor and tutor, who shares Brasch’s and Frame’s strong connections to Otago. She lives in Port Chalmers, near Dunedin.